The train, which was successfully tested, at Hitachi's Stoke Gifford depot. Credit: Hitachi. 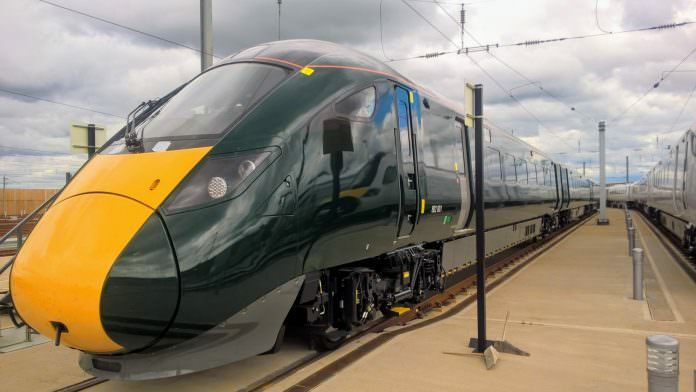 Devon and Cornwall’s new intercity trains are a step closer to entering passenger service following the news that Hitachi has begun testing. On August 8, the first of Great Western Railway’s new Hitachi Class 802s carried out test runs between Bruton and Cogload, Somerset. The five-car train, which was build at Hitachi’s factory in Italy, will now be based at Hitachi’s depot in Stoke Gifford, Bristol, while the test programme is carried out. Hitachi said that two more trains are expected to arrive in the coming weeks. Thirty-six Class 802s are being built in total. Berry Sas, Hitachi Rail Europe’s projects director, said: “This is an exciting milestone for our team as we ensure the trains are delivered on time and in top condition. The bi-mode trains have been financed by Eversholt Rail and will enter service in 2018, connecting London Paddington to Exeter, Plymouth, Penzance and elsewhere. Hopefully these new trains should enter service from late next year or in 2019.